I'm not seeing all of my data in Google Data Studio - how do I update my Settings? 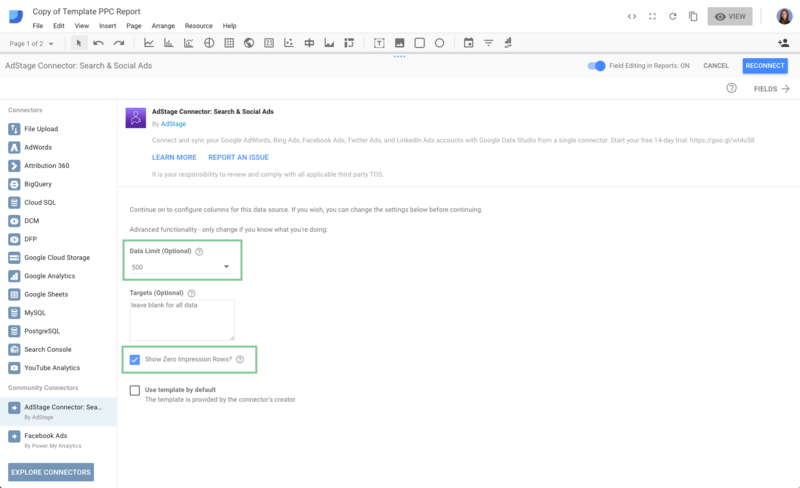 AdStage's Google Data Studio Community Connector comes with a few set defaults. These default settings include a data limit, and excluding rows of data with 0 impressions. 1. Open up the connector's settings. The easiest way is to click Resource in the top navigation and select Manage Added Data Sources. 2. From there, click Edit under Actions. 3. Next click Edit Connection on the left-hand side. 4. Now that you've landed on the settings page, scroll down and update the Data Limit field to 500 and check the Show Zero Impressions Rows box. 5. Click Reconnect and accept the changes.